People sometimes ask me why I go on Adventure rides alone. The answer is that it’s a great challenge to find a riding partner who can do what I like to do (and keep up): ride unpaved roads as much as possible, and who can exit work for 10-15 days at a time. Most of the motorcyclists I know are not able to do that. I’ve been on plenty of trips to remote areas before and taken my BMW R1150R on “Roads Less Traveled,” and been very rewarded in the experience (including VEPCO Road in Virginia, Ashby Road in Ontario, and the Trans Labrador Highway). This journey had rewards of a different variety. Wednesday, June 3 started like most other riding days—a hotel buffet breakfast with careful attention to avoid gluten and unnecessary sugar. Having eaten reasonably well to set myself up for the day, I grabbed two apples and two bottles of water for the tank bag. Then, with the motorcycle loaded, and safety gear on from head to toe, I took off from the Braddock Best Western and started the day’s ride. Thick fog covered the area. It was a remarkably dazzling West Virginia morning. Riding south, I drove by families waiting for school buses at neighborhood entrances. Kids waved at me as I passed. Of course, I waved back, trying to be the good motorcycling ambassador. The Garmin Zumo 660 sent me on Otter Creek Trail into the Monongahela National Forest that continued south to Glady and Beulah around Cheat Mountain. Taking advantage of the untraveled and unpaved National Forest roads, I stopped for a morning snack: the first apple and one bottle of water. More riding brought me to lunch at the Alpine Lodge in Bowden (I posted from there on Facebook about it). Driving further south, I exited Route 92 and stopped below Cheat Bridge on the First Fork River, where I finished most of the second bottle of water and the other apple. Then, I drove onto Mower East Road; a typical National Forest dirt-and-gravel road. Twelve miles in, riding along on a straightaway, I hit a patch of deep, loose gravel in the center of the road. I hadn’t been paying close enough attention to the path ahead of me. The bike started to fall to the left. Reflex and correction took command, slamming the machine over on the right side. It hit the ground hard, spun out, and ended up facing the opposite direction in a muddy ditch on the right side of the road. An unexpected twist – the lurking skid demon reared its hideous head. The crash site on Mower E. Road. In emergency situations like these, reaction is the response. My first instinct was to assess the damage and get mobile again. My Schuberth C3 helmet, with the now-smashed face shield, came off and I stood over the motorcycle. It had been turned around about 210 degrees from the direction I was going! OK, I’ll try to get the machine back on the road and ride it to civilization, where I can get some help. I began to try to drive it out. Then, blood drops started to appear on my tank (They must be mine). I felt my face to find the source: it was my upper lip that was cut. Paper towels from the tank bag addressed that. 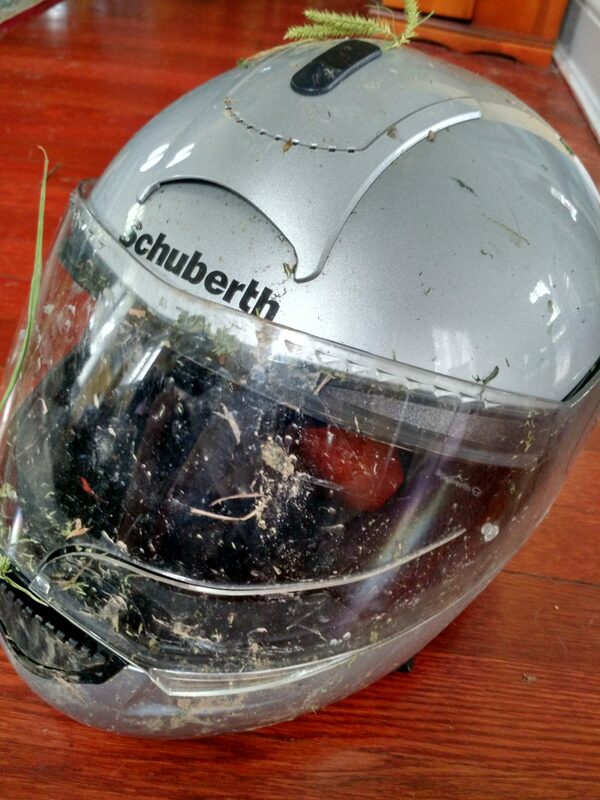 Schuberth C3 Helmet, with smashed face shield and West Virginia grass. The headlight was shattered, as was the windscreen. In addition, the front light assembly was pushed wildly out of shape and the mirrors were splayed. The Touratech GPS mount had been snapped from its stalk. My injuries were a cut upper lip, and some pulled muscles in my left arm, left leg, and back. This was a 40+ MPH crash. There’s no question that the Motoport Ultra II Air Mesh Kevlar Jacket and pants with Quad Armor made all the difference here. The only broken parts were on the machine. I’m a big fan of the protective gear I wear (big nod to Wayne Boyer). Again, I tried to move the bike from the muddy ditch in which it was entrenched, even taking all the panniers off to lighten the load. This was when I discovered that the front brake cable had snapped in the accident. If I could move it, I would travel gingerly, and rely only on the back brake. Burning clutch fluids filled the air as I tried in vain to extricate it from the mud. No amount of rocks and gravel under the rear tire would help. The more I tried, the deeper it went into the dirty, wet abyss. It was clear—the motorcycle was disabled, and would have to be abandoned. There was NO cell service at all. Staying there would have been an exercise in futility. I would not deceive myself to think that waiting for help to pass by would yield a result. There was no one around—no hunters, ATVers, cars, houses, or any sign of civilization. I was alone in the wilderness. I crashed at 3.30 PM and after a half hour of trying fruitlessly to free the broken machine, one thing was for sure—I was on my own. I grabbed my fully charged GPS and what little water remained (quarter of a small bottle) and resigned myself to walking to find help. 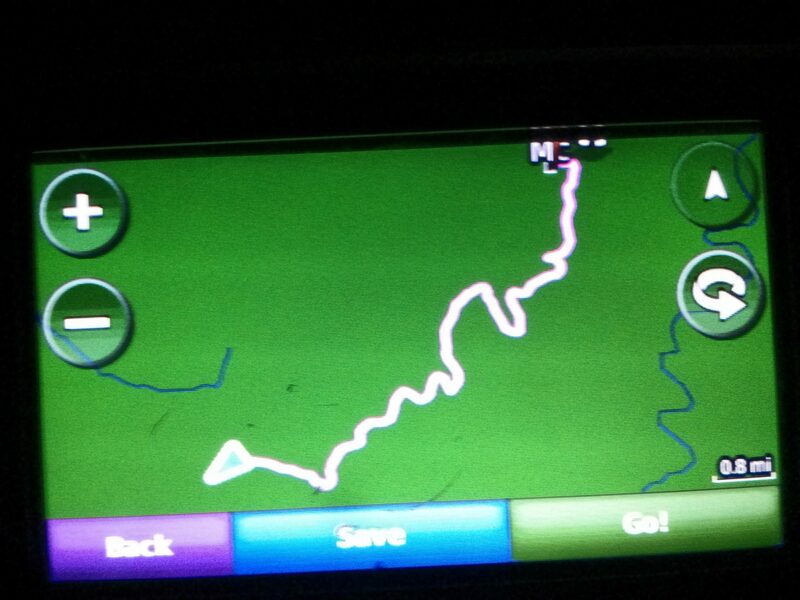 GPS showing route from crash site to Route 66. The GPS showed that south of the crash site, Mower East Road intersected with Route 66 (probably a paved route–a best bet to flag down a passing motorist). That was 17 miles south. So I started walking, in my full Motoport outfit and boots. I thought it better to have protective gear on, even though I wasn’t riding. I may need it to protect me further than it already had! About every minute, I called out “HELP!” in a loud and booming voice. Although it never got a response, animals must have heard and may have been deterred. After all, earlier that day, I did scare away a black bear while riding. While grazing, a startled deer heard me calling and saw me coming. That made for its quick exit, but also demonstrated to me that I must continue to make noise, just to remind the forest dwellers that, although I was a “guest,” I wasn’t looking to meet any of them. 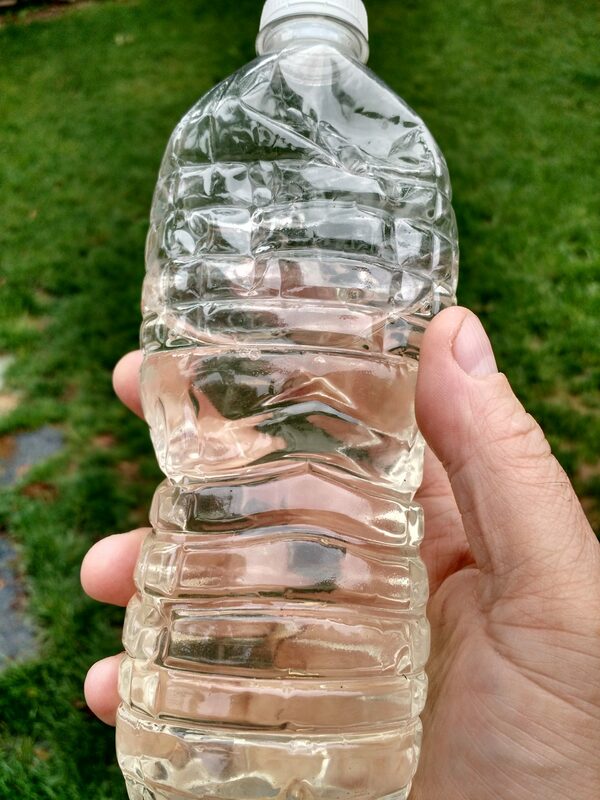 Whenever I found a “clean enough” (and deep enough) puddle, I would refill my water bottle and rehydrate. Roadside streams were even better for that, and cooler. The need for water was a constant on this trek. I required continuous liquid intake to be able to go on, and I could feel myself start to unravel, mentally and physically, when my body needed water. Every mile or so, I would examine the GPS route to be sure I was headed in the right direction, and to see how much further I had to go. Quick checks meant turning the device off after each use, but this ensured battery power conservation. I also shut down all mobile phone power-draining functions, just in case I entered an area that did have service coverage. As I walked south, the sun was setting. It was after eight o’clock and I knew that I had finite minutes of daylight left. Then, hope showed up. I happened upon a house! 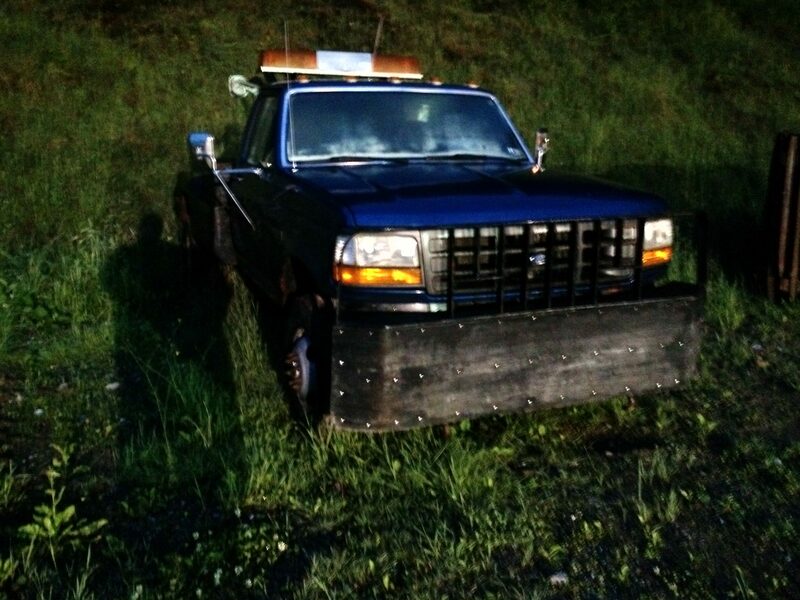 Definitely, with a pickup truck plow parked on the property, someone was going to be there! I shouted for help at the top of my lungs. There was no answer. All doors were locked, and no one was answering my knocking. Nothing. No results. Should I break in and try to find a phone, or take shelter from the impending darkness? These were ethical questions I considered. I would be willing to accept charges for such a “crime” of survival and pay whatever damages it would incur. Beyond the legal problems, there was the personal safety issue of wondering what a property owner would do with a man s/he finds in her/his own home, having broken into it. I decided to keep going, figuring that if there was one house here, there would have to be more as I went further. Darkness was closing in, and this was starting to become a significant threat. I’m unsure about what comes out at night in a forest, and this wasn’t be the best time to find out. Hope rose again when I saw a light in the distance. It was a big building of some kind. I could hear the hum of machinery! Certainly, someone was there and probably doing something! As I got closer, the shadows revealed a water treatment plant. There was a lot of equipment running in the facility, but no one was around. Again, the ethical dilemma—I considered breaking in and was hoping to trip a security system. Maybe, if nothing else came up, I would return and do just that. But for now, I kept going. A half mile after that, I came to the Snowshoe town depot. Hope was waning, as my results hadn’t been much up to this point. There were many pieces of sizable equipment in the yard (including two tow trucks), and a massive, locked garage. Walking around the facility, I could hear a radio playing inside, as I pounded on all of the doors (ironic that someone probably left it on to deter people from breaking in). Again, there was no answer, and there was no apparent easy way to force entry into this place. I started to walk further on the road headed south, but now, it was pitch black out. I couldn’t see anything. Because of all the day’s rain, the clouds covered the sky and remained through the night to block any moonlight. After about 500 feet, I turned back and walked to the depot building yard again. Of the unlocked tow trucks, I picked the “nicer” (newer) of the two climbed in to get some sleep. I turned on the GPS to check the time. It was 9.30 PM. I had been walking for five and a half hours–11 miles since the crash–and had encountered no one. As the rain pounded on the cab roof, it grew colder and colder through the night, but I was protected. Le ChâTow Truck sheltered me from the chill, precipitation, wildlife, and darkness. There was a first aid kit on the front seat. I cleaned my upper-lip cut with alcohol pads and dressed it with a band aid. It would be a stretch to say that I slept, but at least I rested safely. To keep warm, I put on my Motoport gear, liners and all. Although not entirely comfortable for sleepwear, it did help to maintain an acceptable core temperature. I had time to reflect on my situation. I worried about my wife and what she must have been thinking. I check in with her every day when I’m away. The last thing anyone heard from me was at 1.00 PM, when I posted about my lunch on Facebook. Was she panicking; wondering about where I was? That was torment for me, because I couldn’t communicate to her that I was alive, and moving toward resolution of a serious situation. Dawn came at around 5.30 AM, and I was committed to go the last six miles to get to a main road where I could find a fellow motorist and ask for aid. I started walking again, but this day’s trudging was different and worse than the day before. The soreness of my injuries started to have a detrimental effect on my gait. It was extremely slow-going due to the pain of pulled leg muscles. I could barely move my left leg forward. I considered going back to the tow truck, but that would mean no progress. Walking backwards helped, and I did that for quite a while. At a fork, the GPS sent me down a “road” that very few vehicles would be able to traverse. Certainly, if I were riding, I would not have taken it. In fact, I couldn’t have; there was a closed gate barring vehicle entrance. A pleasant sign indicated that “motorized types” weren’t allowed, but pedestrians were. It was rocky, overgrown, uneven, and absolutely hazardous. But it was the shortest distance between me and a connection to civilization, so I kept going. Then, after coming out of that messy quagmire, I took a wrong turn! After a while of walking, I turned on the GPS again to assess my progress and position. A .2 mile correction sent me backtracking a little, and on the right course again. Around this time, I was battling bouts of dehydration and getting stupid. I had to keep talking out loud to myself—to keep hope and focus on the task at hand. The hydration deficit was apparent because I was slurring speech as I’d speak out loud. This was when I really started to consider a possible inevitability—that I wouldn’t survive this ordeal. I had real thoughts of “I’m going to die out here, if I don’t get help soon.” Was I just going to collapse? I considered using my phone to video record farewell messages to my wife and children. Looking ahead at the side of the road, I saw a piece of large apparatus; an earth mover of some kind. Moving closer, I caught sight of a massive home opposite it. I walked up, shouting “HELP!” as loud as I could. Just like my previous experiences, the result was nothing (even though I saw that a second-floor window was open). I moved around to the side of the house, where there was an interior light on. Finally, real hope! I walked to that window, shouting “HELP!” Then, there was a flurry of activity inside. A woman in a bathrobe approached the window and looked at me with an expression of compassion and disbelief. My outstretched hands were clasped together, as I said “Please help me! I’ve been in an accident yesterday and have walked 17 miles from where I crashed.” She motioned me toward the front of the house. I could see her husband getting his shirt on as they opened the door and let me in. They took me into their kitchen. It was 7.00 AM. Dave and Marita opened their hearts and home to let me in and get necessary attention for me. That’s when it all started becoming clear to me about the gravity of my situation. I started to weep, saying “I didn’t think I was going to make it out there.” This was the first time since the crash that I was sure that I was going to survive. They gave me water and coffee. Dave called the local EMS and asked for an ambulance to come to the house. Then, they let me call my wife, whom I hadn’t spoken to in a day. 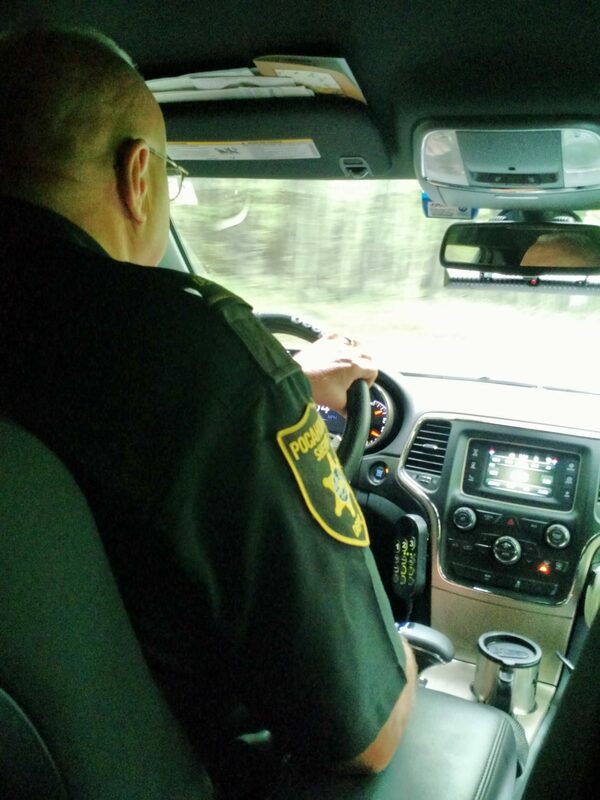 I started by telling her that, although I was in an accident, I was going to be OK.
After checking me out for any broken bones or other injuries, Captain Ross Morgan, Lieutenant Seth Morgan, and Brian McLure took me to Shavers Fork Fire Rescue in Snowshoe. Pocahontas County Deputy Sheriff David Walton arrived. He and Chief Randy Wilfong began poring over maps of the area, and comparing their estimations with my “Last Position” GPS screen. We determined the approximate location of the disabled vehicle. Deputy Sheriff Walton drove me to Buster Varner’s Construction (and towing service) on the other side of the county in Durbin (an hour’s drive away) with whom we arranged to go get the bike. Buster went and got my motorcycle on a flatbed and then set up its and my transport back to New York. While this was going on, I was at the Station #2 Restaurant where I had breakfast and shower (there are hotel rooms on second floor). With the R1150R strapped down in the bed of a pickup truck, Dale and I left West Virginia for the long trek home, on a mission now to get the wounded Motorrad to BMW of Manhattan for repair. 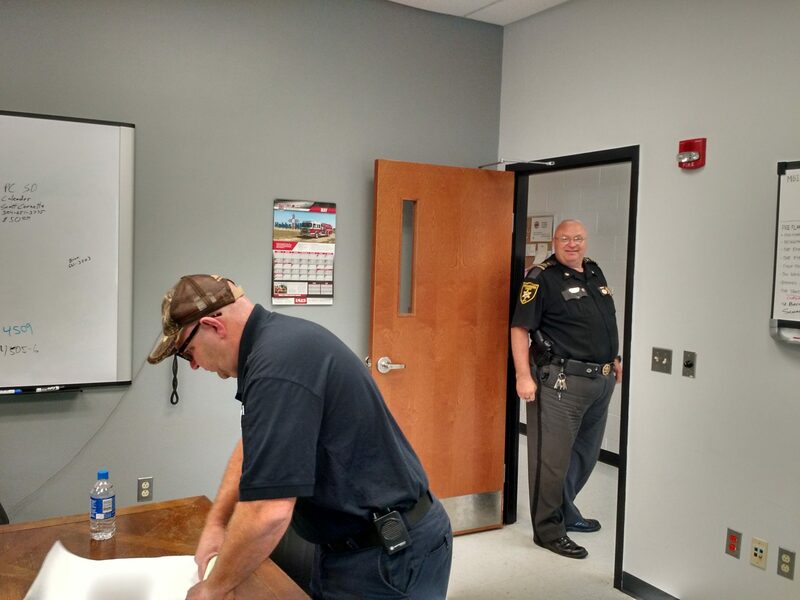 A day after I got home, Dave Walton from the Pocahontas County Sheriff’s Department called to make sure that I had gotten home all right. That was impressive and showed great compassion on his part. Driving from Shavers Fork Fire & Rescue to Varner’s Construction. Sometimes, tumultuous world events cause people to shift perspectives and focus on what’s really important. In other cases, personal realization of values comes quietly, and without fanfare. 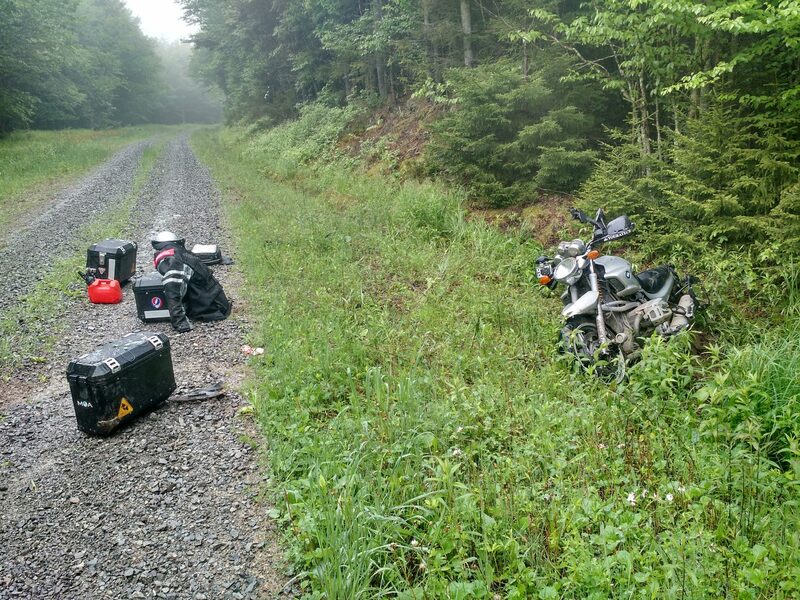 This motorcycle crash and subsequent quest for survival only reinforced my belief that the highly treasured resources of care, courtesy, and compassion are the most important principles that guide and maintain our human ecosystem of interactions. Think positively and keep hope. Surround yourself with the best equipment to get the job done. In this case, it was the highest-quality protective riding gear I could find: a Schuberth C3 helmet, Motoport Ultra II Air Mesh Kevlar Jacket and Pants, British Motorcycle Gear Thermosport gloves, and TCX Touring Adventure X-Desert Gore Tex boots. Always keep communications open. When traveling, especially in remote areas, go with advanced satellite emergency devices (like an ACR ResQLink+™ PLB), a necessity for getting help when it’s needed. Mobile phones are not enough. Over-prepare. Go with more than you’ll need for that day’s ride. Have enough water and snacks in case you get stranded. Double amounts are required. Be resourceful. Use what you have to make the best of your situation (like drinking from puddles and streams, using GPS for guidance and preserving its battery, and sleeping in Le ChâTow Truck). It never occurred to me to check for WiFi when I was at any of the buildings I visited! Live and learn.